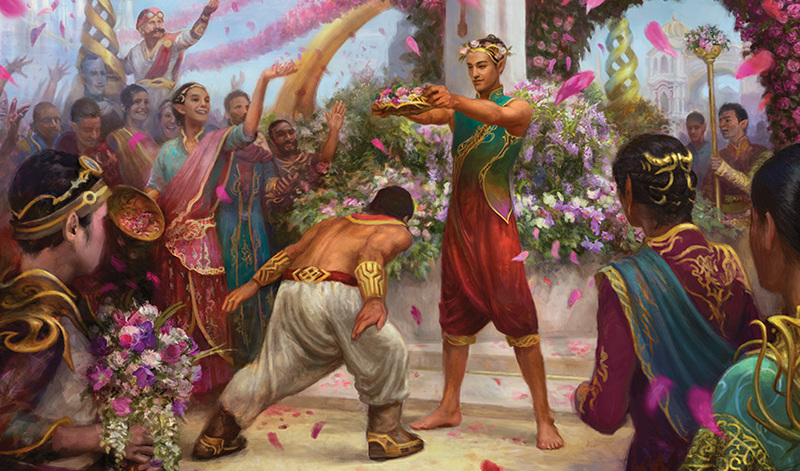 During the events of Magic Story, the Consulate of Kaladesh has been delivering regular updates to the people of Ghirapur regarding the Inventors' Fair and recent events in their city. You can follow the Consulate on social media (Facebook and Twitter) to check out these updates as they happen. 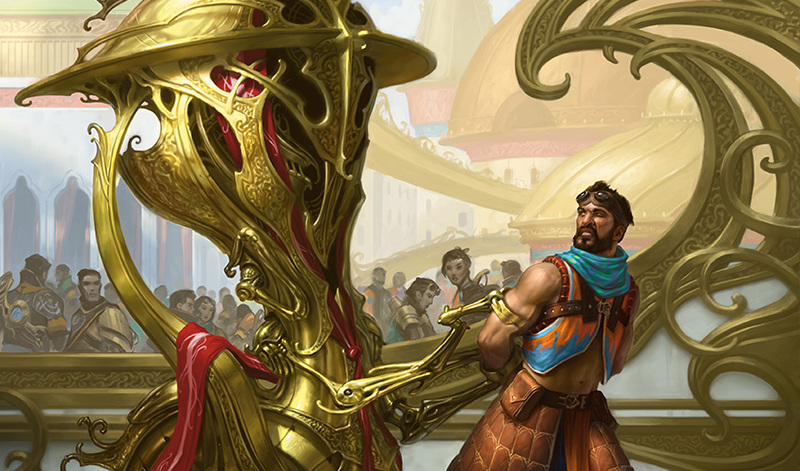 Here's what they've had to say so far, from the beginning of the Inventors' Fair through Tezzeret's confiscation coup. Come one and all to experience the innovation, industry, and imagination of the Ghirapur Inventors' Fair! 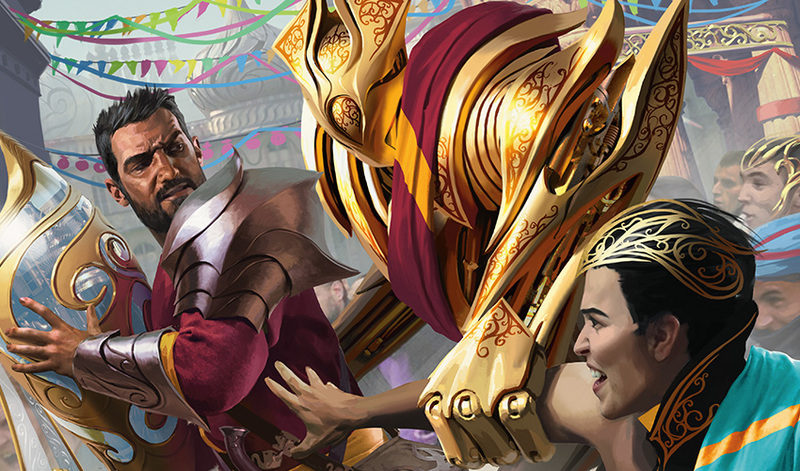 From the wilds of Peema to the metalworks of Weldfast, from the depths of the Cowl to the heights of Lathnu, inventors from across Kaladesh will gather in Ghirapur to show off their marvelous designs and compete for distinction and glory. The Inventors' Fair promises to be the greatest gathering of engineering pioneers in history. The Consulate looks forward to hosting these brilliant inventors, and in the spirit of innovation and creativity, extends a warm welcome to all. Citizens in attendance can expect to be awed and amazed by quicksmith competitions, invention demonstrations, and creative performances. 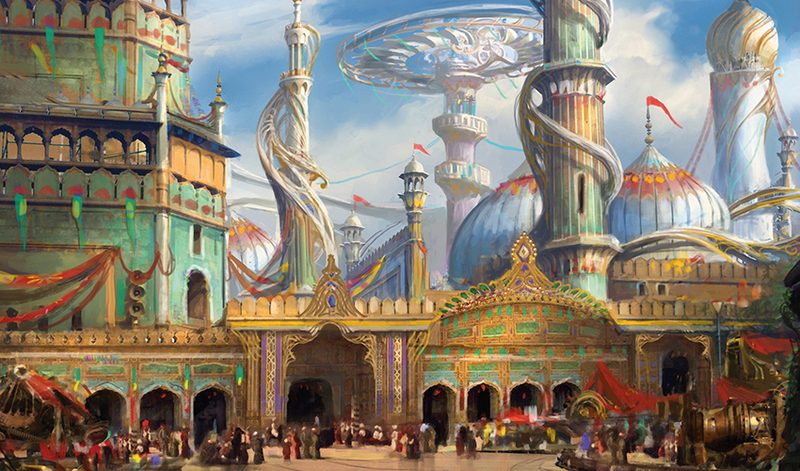 Delicacies from every corner of Ghirapur will be available to sample at the food pavilion, and personally engraved devices designed by some of Kaladesh's most notable inventors and artisans will be for purchase at the Fair's market. Those looking for an adventure can get a bird's-eye view of both the Fair and the surrounding city by way of an airship tour. And the young—and young at heart—will delight in animal construct rides and our 100-acre automaton zoo. With the chance to rub shoulders with tomorrow's luminaries, attend panels, lectures, and autograph signings, and even glean insight into your own domestic projects from some of the best in the industry, this is the can't-miss event of the year! Today, we at the Consulate are delighted and honored to officially open the doors of Ghirapur's Inventors' Fair! The Fair is the culmination of decades of innovation, years of dedication to craft, and months of hard work. It's a place to commend those who have devoted their lives to enhancing our world and improving our lives. We are in the midst of a renaissance of invention, and we invite you to come help us celebrate the wonder that surrounds us. The Consulate prides itself on recognizing ingenuity and providing an inspirational environment for all creators to reach their full potential. There is perhaps no better example of what can be achieved with the support of the Consulate than can be found in the esteemed Consul of Innovation herself, Padeem. The genius behind self-repairing armor, Padeem credits the Consulate for her success early on in her career. 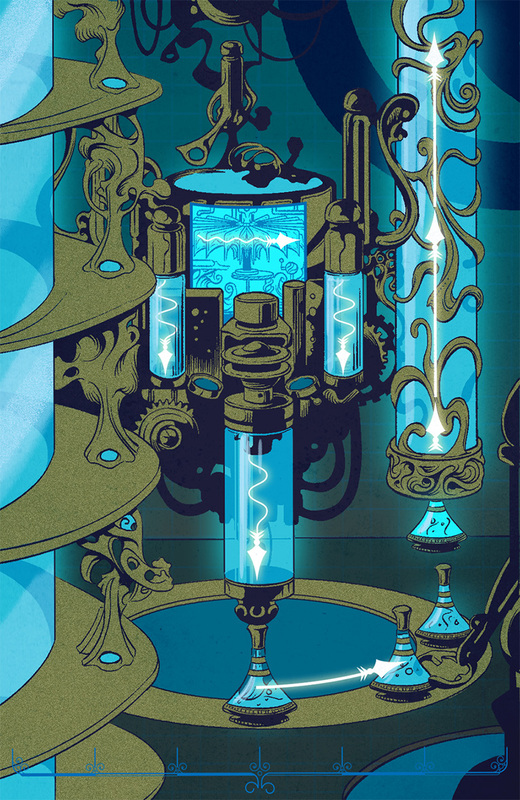 "As a young inventor, I didn't have a fancy research lab or patron, but what I did have was a reliable aether supply to test my designs. Thanks to the Consulate's generosity, I was able to focus all of my energies on my work. It paid off." Later in her career, Padeem was recruited by the Consulate for her sharp mind and innovator's instincts. Decades as a gearcrafter on the quicksmithing circuit prepared her for her current post as Consul of Innovation, where she oversees new designs through all stages of development. We were thrilled to invite Padeem to act as a judge at the Inventors' Fair, and she seemed equally as thrilled to accept. "It is with deep gratitude that I accept this position of judge at the Inventors' Fair. The Fair is precisely the type of event this city needs to appropriately celebrate our extremely talented community of creators. I look forward to being impressed by their work." We invite all citizens to come and be impressed by the work of our inventors. Doors open mid-morning and close at dusk. The quicksmithing arena is open to the public free of charge, and special tours of select venues and arenas can be arranged by request. Commemorative souvenir thopter pictograms are available for purchase at our monitoring station. Rest assured that your safety and quality of experience are our top priorities. Peacewalkers will be present throughout the Fair to ensure your well-being. Additional resources and accessibility services can be found at our Information Booth where you will also find our Child and Automaton Reclamation Zone. Standing taller than many of the buildings that grace Ghirapur's skyline, the Gearhulks are among the grandest creations you'll see on display in the Fair. We challenged five teams of expert designers to build automatons of an extreme scale, with the added stipulation of incorporating a single element of the aether cycle into their design. 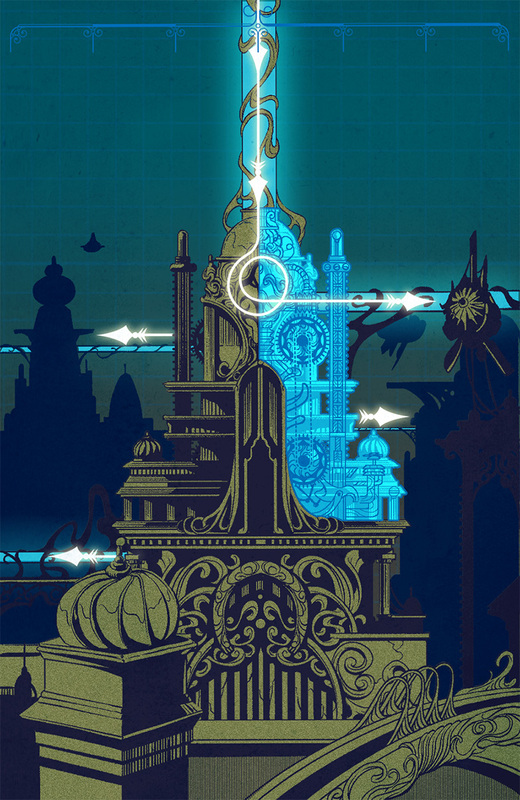 From inspiration to reclamation, the flow of aether governs both invention and life on Ghirapur, so we felt this an appropriate and exciting challenge. We were more than pleased with the results. Each design expresses the individual creativity of its team and captures the essence of their assigned step of the aether cycle. 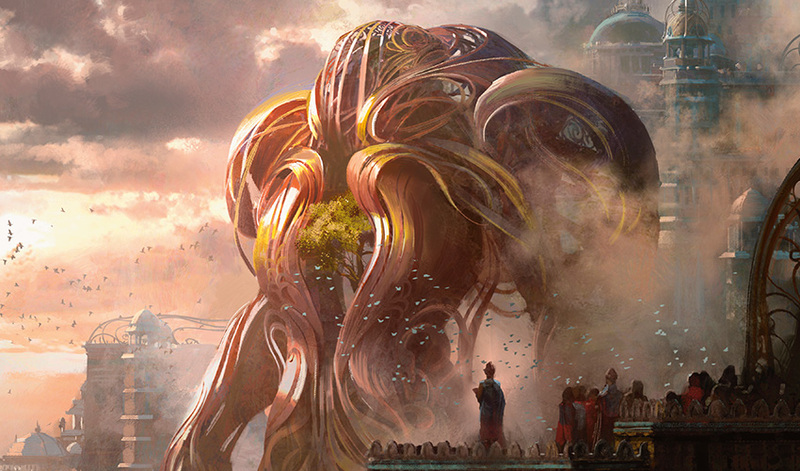 From the living foliage in the chassis of the Verdurous Gearhulk, which inspires all who gaze upon it, to the crackling reserves of liberated aetheric energy that sparks on the hands of the Combustible Gearhulk, these magnificent creations invite all to stop and ponder what it means to be part of the cycle of invention. We encourage Fair attendees to voice their support for their favorite design; we want to know who you think deserves the top honor. Though, for your safety, we must ask that you stay within the designated observations zones when visiting these powerful machines. If you desire a closer look, private tours can be arranged in the evenings when the functionality has been turned off. This evening, Ovalchase will resound with the roar of engines and the cheers of ecstatic fans. We invite you to join us in the stands and take in one of Ghirapur's timeless traditions: the land-based race. Tonight's is sure to be one of the most thrilling of the Inventors' Fair. Inventor-racers from the renowned Ground Grinders society will compete to defend their reputation, while drivers from the Rumble Runners society, the dark horse of the season, will look to unseat them. The Ground Grinders have been a mainstay in the racing community for nearly a decade, racking up more titles than every other racing society combined. However, in the last few months, the Grinders have been met with a string of defeats, their top drivers losing to new talent from both the Rumble Runners and the Burnouts. Concerned fans have watched as the tension within the Grinders' society has mounted with each successive defeat. And it's all coming to a head between their two most prominent racers—veteran Bhejek and rising star Grinning Ren. The question on everyone's mind tonight: will this internal strife prevent the Ground Grinders from winning the most important race of the season? Even the experts don't seem to have the answer; their predictions straddle the line at 50-50. It looks like all of Ghirapur will find out together tonight at Ovalchase! Get your tickets before they sell out. This is a public bulletin regarding the known renegade leader Pia Nalaar. 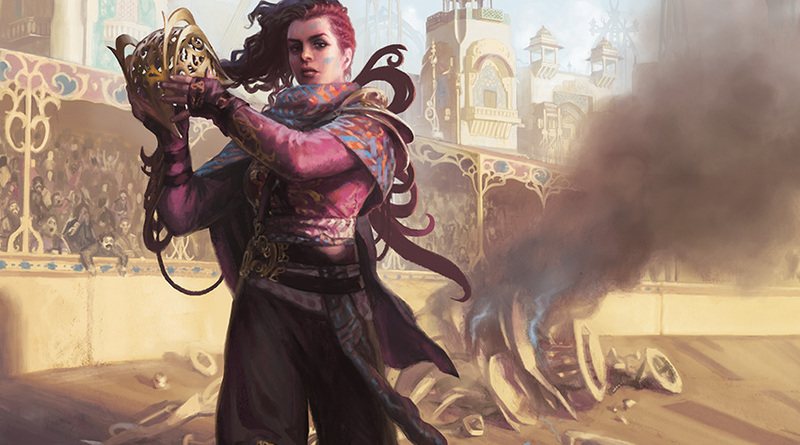 Consulate investigators have confirmed a sighting of the renegade artificer and aether smuggler Pia Nalaar in the vicinity of the Inventors' Fair. 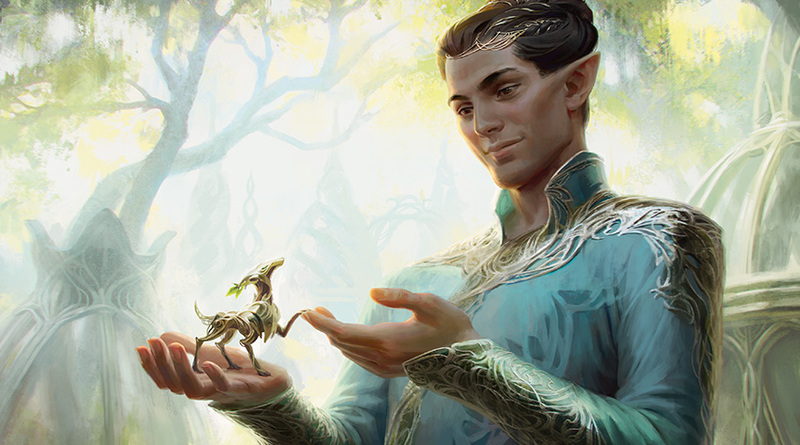 Nalaar has a troubling public record, including malicious modification of devices, embezzlement of Consulate resources, and over a dozen counts of aether siphoning. Nalaar's sighting coincides with reports of renegade demonstrations at the fairgrounds, and we have reason to believe that she is responsible for organizing these dangerous displays. Citizens can rest assured that we at the Consulate are doing our utmost to apprehend Nalaar and her renegade associates. We ask that if you have any further information, please contact the nearest Consulate official or peacewalker. We are working tirelessly to make this year's Inventors' Fair safe for all, and we appreciate your continued support. 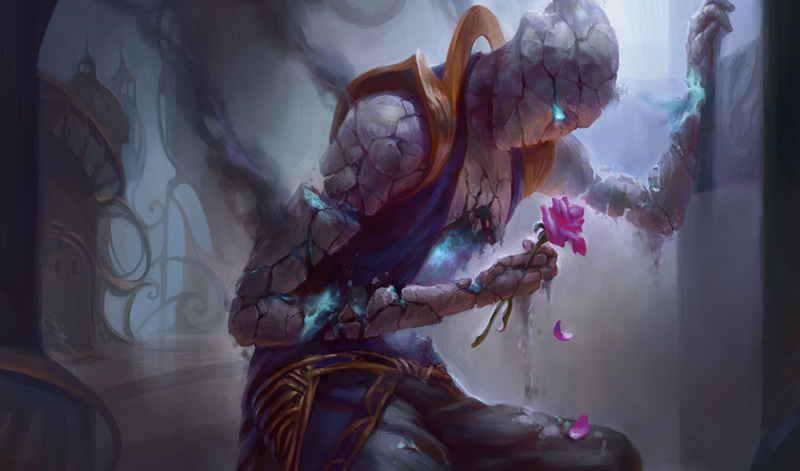 We are all familiar with the way aether impacts the world around us. Who hasn't witnessed the sky light up in a brilliant aetheric lightning display, marveled at the delicate beauty of a flower's petals as they twist open to invite in aether breezes, or stood in awe of a herd of sky whales riding an aether squall? Aether is the most powerful force on our world. And now, thanks to the genius of Avaati Vya and the infrastructure provided by the Consulate, we can all safely use the power of refined aether in our daily lives. 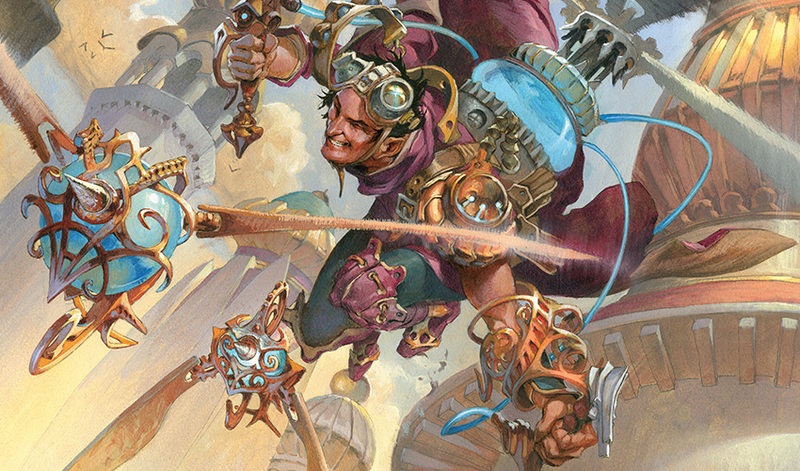 So how does aether get from the sky to your personal automaton or family cruiser? This informative diagram created by our Department of Instruction will take you on the exciting journey from collection through distribution! Today the Fair's judges are proud to announce that Himmat Neela is the winner of the Animal Constructs: Miniatures Division. Himmat was a fan-favorite from the start; many have marveled at his work in the Greenwheel garden domes and fallen in love with his handcrafted creations. This lifecrafter did not disappoint. His miniaturized young elk design is elegantly simple, yet captures the nuances of life and the essence of the wild. Himmat's design will make an excellent companion for construct-lovers of all ages, and we're eager to see it enter mass production. When asked about his process, Himmat told our Department of Inquiry, "Nature is the greatest artificer, and to do this piece justice I had to stop and listen to what nature had to say and allow it to teach me once again." Originally hailing from the outskirts of Peema, Himmat expressed recent difficulty in truly connecting with the natural world, even in the gardens of Greenwheel. His search for his lost bond took him to the Cowl, the wild strip of forest running through the heart of Ghirapur. "I spent two weeks in the Cowl living in the wild, just relishing in the wonder of the plants and animals around me," Himmat explained. "I paid attention to what they were silently saying. Their subtle motions inspired me, and I found myself reaching, as they did, toward aether with every step, every movement. When I could navigate the forest with my eyes closed, that's when I knew it was time to craft again." Thanks to his extended stint in the Cowl, Himmat nearly missed the submission deadline for the Fair, but after seeing the results of his efforts we couldn't be more pleased that he made it in time. The Consulate is proud to honor the work of an inventor who has brought joy and wonder to the visitors of the Greenwheel domes for years. We hope his work inspires a generation of new lifecrafters. With the Inventors' Fair in full swing, the streets—and skies—of Ghirapur are brimming with celebrities! Sky derby racer extraordinaire Depala was spotted running pit stop drills at the Aviaries for the third evening this week. And in her usual fashion, she pushed her crew and her airship to the limit; rumor has it they broke the record for fastest rudder replacement yet. Having advanced easily through the qualifiers and first round of competition, Depala will be racing in the second round tonight, representing the Derby Crows. Surely she's hoping her drills will pay off and help her secure a finish ahead of long-time rival pilots from the Wind Kin and Cloud Tumbler societies. Humanitarian and socialite Yahenni announced yesterday that they will be rescinding their position on the board of directors for Kurna Enterprises after the Inventors' Fair. Yahenni has made their name not only as a respected investor, helping to fund many successful engineering enterprises, but also as one of the most popular and well-loved debutants in town. When asked for comment they jovially responded, "Why spend the rest of my life in a boardroom when I can spend it partying in my own house, darling?" They then went on to invite the entire Department of Inquiry to a celebration being held later this week. As the authenticity of the invitation was unclear, the Department of Inquiry declined to comment. The Consulate wants to reassure the public that our security forces are working to ensure a peaceful and safe Inventors' Fair. Rumors of sightings of crime syndicate leader Gonti are unsubstantiated. We have no reason to believe that the aetherborn has been in attendance at the Fair. But as always, we encourage citizens to continue reporting any suspicious activity to Consulate authorities or the nearest peacewalker. Thank you for your help in keeping the Fair safe! Gremlin management is a necessary task for all home and business owners in Ghirapur. The warm season is gremlin breeding season, and that means more encounters with these curious critters as they emerge to hunt for mates. 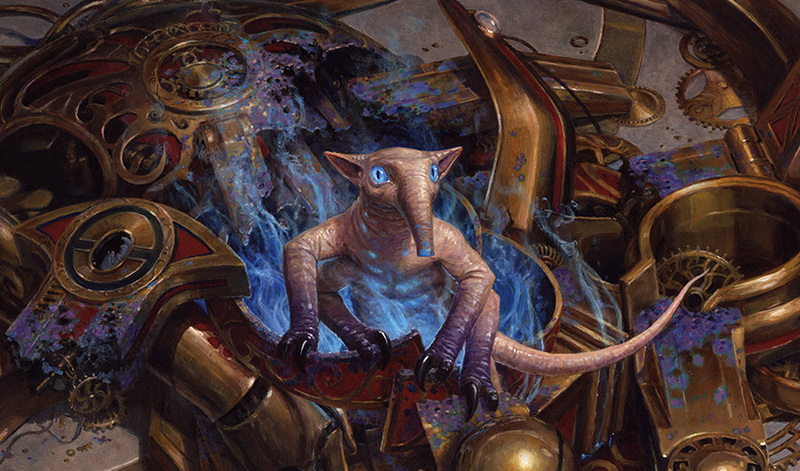 While gremlins have been labeled by some as "cute," all citizens should be aware that gremlins are dangerous wild animals, and must be treated as such. Do not attempt to approach, pet, or feed them. Citizens charged with feeding wild animals will be subject to fines and/or extensive community service time. All it takes is one citizen giving one gremlin a snack of aether or an aether-powered device to start an infestation. Please do your part to keep our city gremlin-free. Lock the doors and close the windows of your workshop any time you leave it unattended. 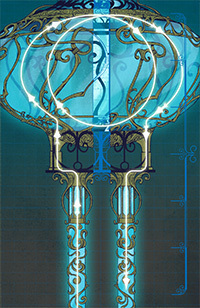 Install a Consulate-approved, tamper-resistant access cage around your personal aether socket. Use gremlin deterrents such as resistant tarpaulin and bandar urine to protect your exposed inventions. For more extensive infestations, humane traps are recommended and can be purchased from most general supply shops. Renowned gremlin exterminator Pav Pande recommends using drastic measures only in cases of extreme infestation. "An exterminator's primary goal is to rid infestations through humane means. A gremlin that is too accustomed to sentient-being contact, however, is a very serious problem. Education and proper precautions are the best ways to ensure a safe environment for all beings in the city." 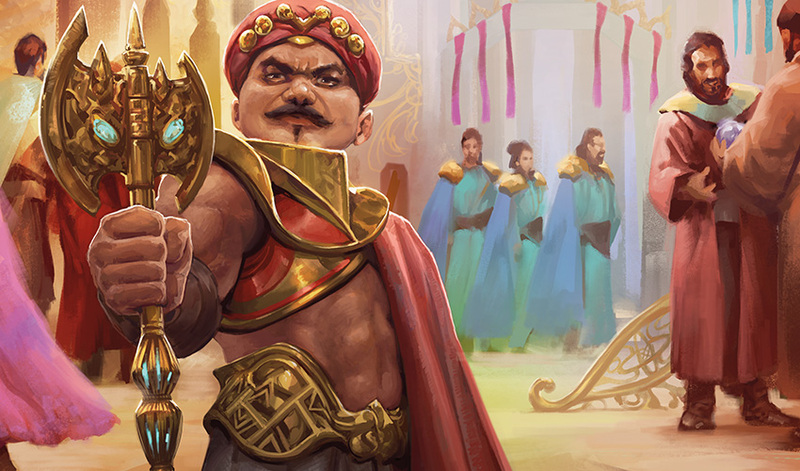 On behalf of Head Judge Tezzeret, the Consulate is pleased to invite you to the exciting conclusion of the Inventors' Fair, the Grand Exhibition! This event will be held at the main arena and open to the public free of charge. The Grand Exhibition promises to delight and amaze. You will hear from our most esteemed judges, behold mind-boggling demonstrations of invention from top finishers, and cheer as everyone's favorite pilots receive their awards. But that's not all. The Grand Exhibition will close with a highly anticipated quicksmith competition, featuring none other than Head Judge Tezzeret himself. As this is a special event, broadcast will be limited and seating is expected to reach capacity, so be sure to get your ticket in advance. Tickets can be obtained at the Information Booth. We look forward to hosting you at this wondrous celebration of innovation! This is a special message from the Ghirapur Consulate to inform all citizens of a new city-wide ordinance. The unfortunate events that unfolded at the Grand Exhibition of the Inventors' Fair came as a shock to those of us here at Consulate, as we are sure they did to all of you. While we have been diligently monitoring renegade activity across Ghirapur in an effort to ensure your safety, this uprising has made it clear that we have not been active enough; more severe measures must be taken. After a period of intense deliberation, the eleven consuls and our esteemed head judge Tezzeret have established a safety program, which we trust will help to secure Ghirapur against future renegade attacks. The Consulate will seize and impound all unregulated and potentially dangerous inventions. As a first step in this new safety program, any devices, automatons, equipment, or vehicles not approved by the Consulate must be surrendered to Consulate officials, peacewalkers, or one of the designated official deposit receptacles located throughout the city. This includes Consulate-approved devices that have been modified without official authorization. We ask that you use only approved mass-market items stamped with the Consulate's seal of quality and safety. This ordinance also requires that all new and untested inventions be surrendered at this time. That includes inventions submitted as entries to the Inventors' Fair. We cannot risk allowing potentially hazardous devices to fall into the wrong hands. We understand that it can be worrisome to part with your new creations, but we assure you, this is the best way to secure the city. Your inventions will be returned to you once renegade activity has been quelled. 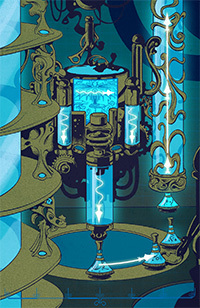 In the meantime, inventions will be kept in our secure facilities within the Bastion under the guard of the Honorable. Rest easy knowing that your creations are in our hands and away from dangerous renegade factions. This ordinance has been established for your safety and the protection of our magnificent city. Thank you for your cooperation. This is a special message from the Ghirapur Consulate to inform all citizens of two new city-wide ordinances. All citizens must be in their homes with doors locked and windows shuttered between last and first light. As part of the safety program established by the eleven consuls and our esteemed head judge Tezzeret, we are implementing a city-wide curfew. We are keenly aware of increased renegade activity on our streets after nightfall; this ordinance is designed to disrupt destructive and dangerous tactics, and allow us to apprehend deviants. We recognize that a curfew may put a strain on the creative activities and business operations of our citizens, and thus we will do everything in our power to quash renegade forces as quickly as possible so regular activity can resume. To that end, we have deployed a new fleet of Consulate observation thopters to help enforce the curfew and spot suspicious activity. Renegade forces don't sleep, and neither do we. All citizens must submit to a background check; those who pass will be allotted an aether quota. The Consulate must strictly regulate aether distribution within the city because renegades have been using publicly supplied aether to power weapons and vehicles. 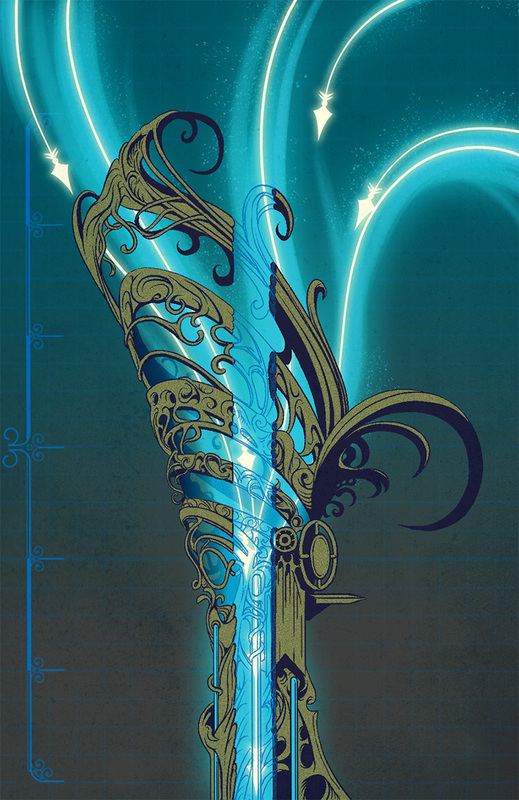 By depriving them access to aether, we can prevent these dangerous devices from functioning. As we implement these regulations and quota, personal workshops and private businesses may experience delays in their regular canister shipment, and pipelines might be shut down intermittently. We ask for your patience, understanding, and cooperation during this time. Your safety and the protection of our city are our top priorities. As always, we encourage citizens to report suspicious activity to a Consulate official or the nearest peacewalker. Ghirapur is a city built on the cooperation and unity of our brilliant citizens. With your support, it will thrive once again.